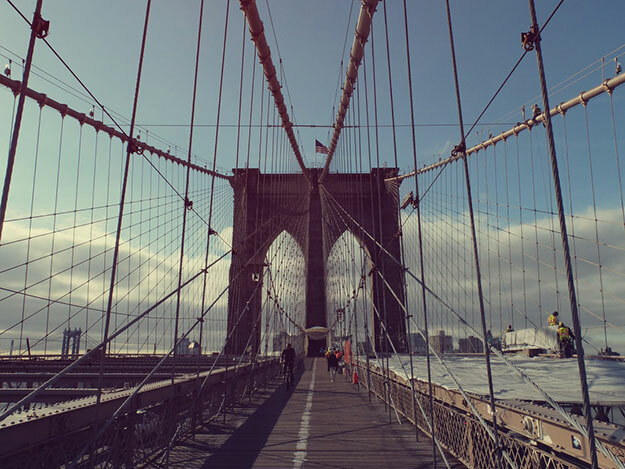 When planning sightseeing outings in NYC, one of the last things that comes to mind is doing it by bike, let alone pedaling across the Brooklyn Bridge! It’s not only possible, it’s a blast! And, it’s do-able for anyone comfortable riding a bike, thanks to the NYC Greenway, a multi-borough system of bike-friendly greenways linked by street connectors with dedicated bike lanes. Imagine biking along Manhattan’s waterfront, through parks, down city streets, under bridges and across the Brooklyn Bridge, all in the company of an engaging, well-informed, confident guide. This is a spectacular way to experience NYC, and nobody does it better than Bike and Roll. The Brooklyn Bridge Bike Tour begins in Battery Park. The pleasant staff takes the time to adjust comfortable, well-maintained bikes to suit each rider. The 3 hour, 12-mile ride moves at an easy pace, along the southern tip of Manhattan and through Lower Manhattan. There are pedestrians, there is traffic and some maneuvering around them (this is, after all, Manhattan), but the route is safe and carefully chosen. There are plenty of pedaling breaks to take in the sights, hear interesting facts and anecdotes, and take photos. The route usually crosses over the East River into Brooklyn via the dedicated bike lane on the Williamsburg Bridge, north of Brooklyn Bridge. Cycling through Brooklyn, it’s easy to see why it’s the newest Manhattan alternative. DUMBO (Down Under the Manhattan Bridge Overpass) is vibrant and hip; Brooklyn Heights has lovely residential brownstones, shopping and dining; waterfront views from nearby Brooklyn Bridge Park are spectacular. The ride back to Manhattan over the venerable Brooklyn Bridge is exhilarating! A symbol of American ingenuity, progress, and drive, it is memorialized in music, books, plays, film, photographs and art. Getting up to the dedicated pedestrian and bike pathway above the car traffic is a bit of a pedal, but it’s so worth it! A total of 5989 ft. long, and crossing the East River by a single 1595 ft. main span suspended in a graceful arc by 4 steel cables, each 15 ½” in diameter, made of 5434 parallel steel wires, it’s an engineering marvel of many “firsts.” When completed in 1883, it was the largest suspension bridge in the world, and often called “The Eighth Wonder of the World.” Biking over it, high above the river, the Neo-Gothic granite towers seem massive; the suspended archway, astounding; the views of the Manhattan skyline, breathtaking. Bike and Roll Tours run April through October. Bike Brooklyn Bridge Tour is a moderate level ride, not for kids under 12. However, their Central Park Bike Tour is a great ride for children as well as adults. The 9/11 Memorial Bike Tour, combining biking and some walking, is an easy ride for the whole family.